Need more information about booking Home 7145878 ? The house is located on the beautiful island Harstena on the Swedish east coast. Harstena is situated in Gryt's archipelago outside the city Valdemarsvik. Tour boats depart from the port Fyrudden on main land every Monday to Friday all year around. In the summer you can also go on the weekends and from other ports. Please contact us if you want help with the boat reservations. 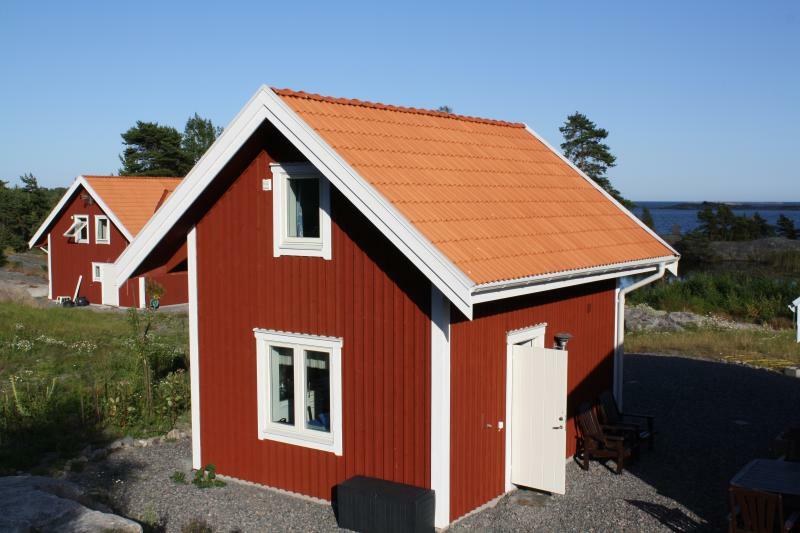 The house is located only 100 meters from the Baltic Sea and has a spectacular ocean view. On the top floor there are one bedroom with a double bed and an open hall with one bed and one extra bed. There is a rocky beach and a small stone beach nearby where the children can play or swim. On the island there is a restaurant and a minimarket. You can also buy fresh and locally smoked fish. In the village you can buy fresh bred in the bakery or take a “fika” at the café. Notice that the stores are only open during summer. Harstena is located at the edge of the archipelago and you can see the horizon over the open sea. It is known that the island was inhabited already in 1543 and the villagers lived mainly on fishing and seal hunting. Nowadays, the island is a place where visitors can stay and experience the genuine atmosphere. The well preserved old fishing village provides in a unique way, an insight to into the former living conditions in the archipelago. Harstena is a place where you can enjoy the calmness, sea life and the nature. You can rent a kayak or rowing boat and reach a lot of small islands for bath or fishing. You can also join the fishermen on a fishing trip or a seal safari. The nearest airport is Norrköping. From there you can go by bus to the harbor at Fyrudden (65 km). It is also possible to go by bus from Skavsta airport (130 km). You can get in touch with Gunni (the owner) through the contact form on this page. Send Gunni (the owner) an email through the contact form on this page. Alternatively, if there’s a phone number on this page, you can call them. How do I contact Gunni (the owner)? If you’ve already booked, go to Manage your holiday booking to view Gunni the owner's contact details or send them a message. Or send Gunni (the owner) an enquiry through the Contact the owner/manager form if you’d like a quote or more info first. When you pay online through the Book your stay form, a booking request is sent to Gunni (the owner). You’ll find out within 24 hours whether they’ve accepted - no money will leave your account before then. You can also request a quote from Gunni (the owner) through the contact form. The owner will email you the total cost for your dates and a link to book and pay online. Use the Book your stay form to pay provisionally online. You can pay by credit/debit card or PayPal. Gunni (the owner) will have 24 hours to accept the booking and no money will leave your account before then. Why can't I call Gunni (the owner) before booking? You’ll need to contact Gunni (the owner) to do this. Send them a message in Manage your holiday booking or through the contact form on this page. You can request to change the dates or number of people on your booking via the Manage your holiday booking page. To change your holiday dates use the Edit booking button. If you need to change the number of guests staying then send Gunni (the owner) a message. If Gunni (the owner) agrees, they’ll send you a revised quote outlining the changes. You can review and accept/decline this from the Manage your holiday booking page. You’ll have 48 hours to take action before the revised quote expires.